Despite the early selldown, the FBMKLCI managed to narrow losses at day’s end, closing 2.52pts or 0.2% lower to 1,511.11 thanks to bargain hunting on selected blue chips. Market breadth also improved as gainers/losers ratio rose to 1.12x against 0.13x on Tuesday. As risk-averse investors continued to stay on the sidelines, volume reduced to 1.695 billion shares against Tuesday’s 1.742 billion shares. Yet, sentiment was cautious throughout the day, weighed mainly by uncertainties in Middle East and North Africa. We anticipate more wild swings ahead as investors are taking a wait-and-see approach with regards to the ongoing crisis in Mideast, amid Libya's greater importance for world energy markets (contributes about 2% to global output), and Gadhafi's defiance against mounting protests. 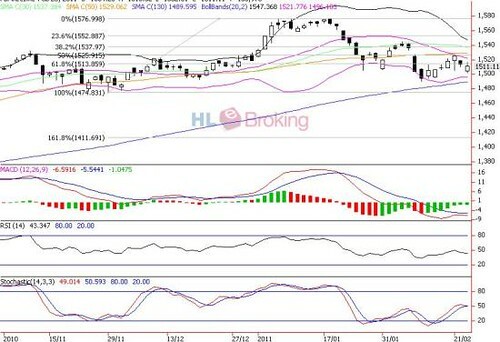 Overall, the nearly 15 point KLCI decline over the last two days and the failure to violate the middle Bollinger band have temporary punctuated the technical rebound that started from the trough of 1490 (11 February). Immediate support levels are 1500 and the lower Bollinger band of 1496, followed by 1488 (130-d SMA) and 1470 (150-d SMA) while resistance are 1525 (mid Bollinger band), 1530 (DTL, Down Trend Line) and 1537 (38.2% FR from low of 1474 and all time high of 1577) points. Daily FBM KLCI: Defending The Crucial 1500 Psychological Level.